Organizers of the 2024 Paris Olympics want to add a new sport to the games. Straight from the streets of New York City, breakdancing appeals to young audiences. But whether this athletic dance makes the International Olympic Committee cut as a sport remains to be seen. Last week, Paris organizers proposed a 2024 debut for breakdancing. 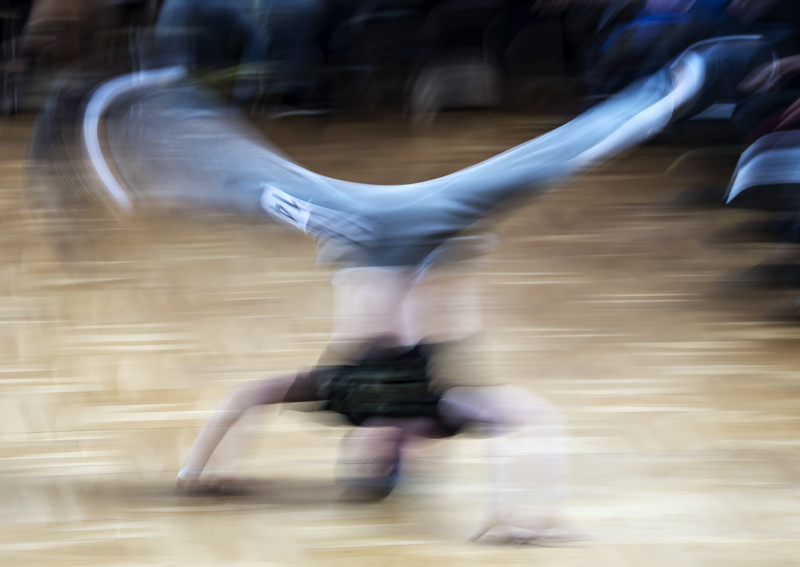 “Breakers” (the name for breakdancers) hail the move as a milestone that will boost breakdancing's global influence—and its acceptance as a bona fide competitive sport. "It's a victory for us. Even if it goes no further, we'll still have won," says Mounir Biba, one of the leading breakdancers in France. In competitive breakdancing, breakers—alone or in teams—face off against each other in "battles." They take turns showing off an array of imaginative and acrobatic moves. A judging panel picks the winner. "There's simply no doubt about the athletic aspects of the discipline," says Biba, fielding questions about how breaking qualifies as a sport. "I defy Cristiano Ronaldo [Portuguese soccer player] to do just one of my movements," he says. Also on Paris organizers’ wish list are climbing, surfing, and skateboarding. Those three will make their Olympic debuts at the 2020 Tokyo Games. Tony Estanguet, head of the Paris organizing committee, says the 2024 committee wants "to connect the games to their era." Organizers note the proposed sports have broad appeal to young people as well as large audiences on social media. What do you think about adding breakdancing, climbing, surfing, and skateboarding? Cool... I think it would be neat to add breakdancing. Call me old-fashioned, but I don't think what they have in store for the 2024 Olympics is a great idea. I'd rather they stick with actual sports, like swimming and gymnastics and stuff. We don't have to make EVERYTHING appeal to the younger population (I'm not trying to offend anyone who thinks that this stuff is a good idea, I'm just getting my opinion out there). Also, I reeally want to make it to 100 comments on the Gun Clubs in Schools article. Can y'all help me out, please? I think it's at 65 comments right now. Their adding skateboarding, breakdancing, and surfing... AWESOME! I think it would be cool if they added those things to the Olympics! whats he mean by "I defy cristiano ranaldo with one of my moves? Don't they do break dancing in night clubs? I don't think this is a good idea. Plus they will probludly dance to night club music! I think surfing is good but scatebording? I don't want to offend eneyone that's just my opinion. That would hurt my head!! I think it would be cool to watch people breakdance in the Olympics! In answer to your question about what the guy meant by "I defy Cristiano Ronaldo..." I think he was just basically saying that breakdancing is a sport because it requires a lot of skill and practice, just like soccer and stuff. Does that make sense? I think he was saying Cristiano couldn't even do any of his moves. I think that that is a good idea! This is pretty interesting... I don't really think breakdancing could count though, because it's not really a sport... but I do think climbing, surfing, and skateboarding would be cool. I guess I'm old-fashioned too, Lena P. and Tabitha B.!!! I agree with you:) But I think they should add climbing and surfing..... maybe not skateboarding though. I agree with you with sticking to sports. It's like their getting desperate or something to add something. Thanks you answered my question! Samuel you are right Renaldo could NEVER do those moves!!! Or maby he does just not on the soccer filed!!!! Yes that makes since But!!! Breakdancing is NOT A SPORT!!!!!!!! breakdancing is not a sport!! I TOTALLY AGREE WITH YOU!!!!!!!!!!!!!!!!!!!!!!!!!!!!!!!!!!!!!!!!!!!!!!!!!!!!!!!!!!!!!!!!!!!!!!!!!!!!!!!!!!!!!!!!!!!!!!!!!!!!!!!!!!!!!!!!!!!!!!!!!!!!!!!!!!!!!!!!!!!!!!!!!!!!!!!!!!!!!!!!!!!!!!!!!!!!!!!!!!!!!!!!!!!!!!!!!!!!!!!!!!!!!!!!!!!!!!!!!!!!!!!!!!!!!!!!!!!!!!!!!!!!!!!!!!!!!!!!!!!!!!!!!!!!!!!!!!!!!!!!!!!!!!!!!!!!!!!!!!!!!!!!!!!!!! Oh sorry, I think I explained the answer to the question you posted a little wrong. I meant that the guy who said "I defy Cristiano Ronaldo to do one of my movements" was trying to prove his opinion that breakdancing is a sport. I agree with you that it's not a sport. I think we just had a slight misunderstanding. Does that make any sense? I'm sorry if it doesn't. I think it will be cool to add some new sports I mean what if you guys were really good at breakdancing and you always wanted to be in the olympics but you found out that you couldn't. That would be terrible! So I think it's good that they are including more sports. But thats my opinion so I don't want to hurt anyones feelings with it I just want you to step in their shoes. I do gymnastics.... well I used to me session is over right now but I might start again in the winter. Right now I am going to be doing swimming. Also I think surfing, skateboarding AND breakdancing is a sport. I mean running is a sport so why can't dancing be one? it makes perfect sence to me!!!!! that was not meant to be my subject. I would absolutely watch breakdancing in the Olympics, and would be excited to see climbing, surfing, and skateboarding. This gives the Olympics a chance to redefine "sports" for a new generation and give more talented athletes a chance to compete on the world's stage. Dancing is totally a sport and deserves to be recognized as such. In the comments, I have a special challenge for you all! It'll be a surprise! Spread the word!